This slim novel is beautiful and creepy, oddly disturbing and yet practically poetic. In Every Heart a Doorway, Nancy is a 17-year-old who’s more disaffected than your typical disaffected teen. Nancy spent years in the Halls of the Dead after stumbling through a hidden doorway… and now that she’s back in the world that she grew up in, she doesn’t belong at all. So her parents send her to boarding school, hoping it’ll cure her of her oddness and delusions and turn her back into their “normal” daughter. But this isn’t just any boarding school — it’s Eleanor West’s Home For Wayward Children, and it’s filled with teens who’ve been dumped back in the so-called real world after traveling to strange and mysterious lands. But how do you adapt to an ordinary life after experiencing something so extraordinary? For most, the simple answer is — you don’t. Most of these teens will spend their lives yearning for and searching for their doorways back to the place they consider their true homes. As Nancy adjusts to this odd school, she meets a girl who lived in a Nonsense world, and one who walked on rainbows. There are strange terms used to describe the various destinations, like High Logic and High Virtue. There’s a boy who lived in a world populated by skeletons, where he fell in love with Skeleton Girl, and a boy who fell through a Prism and became a Goblin Prince in Waiting, but was rejected when it was discovered that he had been born a biological female. There are twin sisters who lived in a dark and menacing world called the Moors, where blood and body parts were the center of their lives. What all these children have is common is the burning desire to return and the despair stemming from not knowing how to get there. Every Heart a Doorway may sound odd, but it’s odd in the very best way. Some of the worlds describe are icky and creepy, some are filled with unicorns and rainbows, and Nancy’s Halls of the Dead is a colorless world where absolute stillness is the ultimate virtue. There’s a beauty to the descriptions, and the sense of longing and displacement that the children feel is palpable. She stayed where she was for a count of ten, enjoying the stillness. When she had been in the Halls of the Dead, she had sometimes been expected to hold her position for days at a time, blending in with the rest of the living statuary. Serving girls who were less skilled at stillness had come through with sponges soaked in pomegranate juice and sugar, pressing them to the lips of the unmoving. Nancy had learned to let the juice trickle down her throat without swallowing, taking it in passively, like a stone takes in the moonlight. It had taken her months, years even, to become perfectly motionless, but she had done it: oh, yes, she had done it, and the Lady of Shadows had proclaimed her beautiful beyond measure, little mortal girl who saw no need to be quick, or hot, or restless. Ah, I loved this book! It’s a short, quick read, but I would have loved to get even more! The writing is just so lovely — but then there are parts that cross from poetic to bluntly bloody, as when a group of friends has to dissolve a body in acid in order to free the bones from the flesh. Of course, Every Heart a Doorway could also be taken as a metaphor for the teen experience. Parents mean well, but just don’t get it. They try to to “fix” their children — who don’t need fixing at all. Teens search for the place that feels like home, where they can be their true selves, rather than trying to conform to a world where they always feel out of place and misunderstood. Or… you can just read it as a straight-up fantasy tale that takes us behind hidden portals into worlds of wonder and dread and eerie splendour. I kind of prefer that approach, to be honest. I was surprised to see on Goodreads that this is the first in a three-part series, rather than a stand-alone. I will definitely want to read more from this world. Meanwhile, I’m thinking that I’ll follow up with the audiobook, so I can concentrate less on plot details and more on the sound of the language of the book. 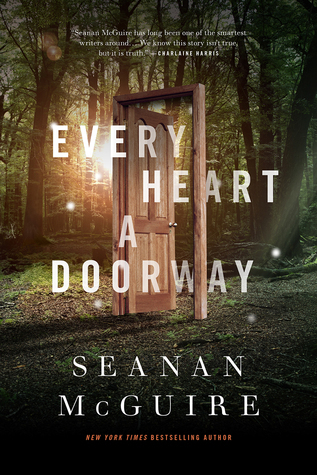 Every Heart A Doorway casts a magical spell that veers between beautiful, sinister, and downright creepy. Highly recommended for readers who enjoy a touch of the magic and the macabre — and enjoy it even more when the borders between the two become blurred. Ooh, this sounds really interesting! Creepy, yes, but in a good way 🙂 Great review! Thanks! It’s such a great read. Thanks so much! Yes, there are some ickier parts, but over all, it’s very dreamy and beautiful. This sounds like fun. Thanks for pointing it out. Great review. This sounds fascinating and quite unique – I love how it turned from poetry to something a whole lot more brutal. It’s really a brilliant read. The author creates this eerie, magical mood that keeps up through the whole book, even when things get bloody. I remember you blogged about this book being on your shelf. Glad you liked it – I love that cover! I did love this book! The writing and the story were both wonderful. The only problem I had with it was that I wanted more. It was too short! I agree! I want to know the full story of each of the other worlds! Great review. I really want to read this one. I first heard of it in a review on a booktube channel called Kalanadi and both of you have convinced me to get it. I think it’s one I need to own so I can highlight stuff.